How cool is this terracotta birdhouse? The Casa Cotta was designed by Sydneysider Dennis Abalos, a Sydney-based designer of furniture, lighting and homewares. Abalos has recently turned his attention to creating a neat abode for birds in order to encourage nesting, especially in urban areas. He says he chose terracotta as the primary material because it can be left in the weather all year round and is easy to clean. 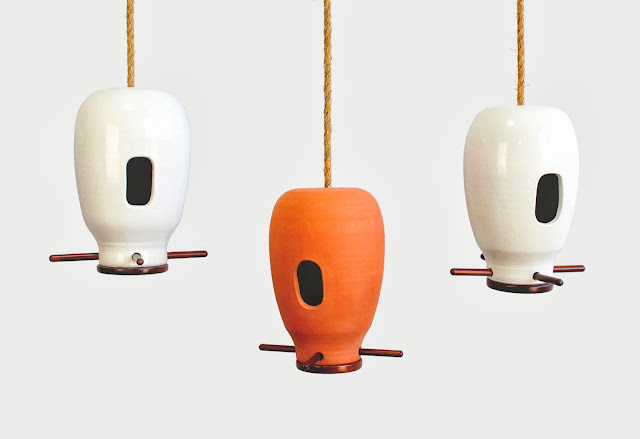 The birdhouses are handmade by master potter Richard Rickert and his son Johannes, who run Pilliga Pottering in Central New South Wales. Once out of the kiln, they are lightly sanded and oiled (if natural) and polished (if glazed) to give the final touches. Rope them up under a shady branch ready for birds to move in!